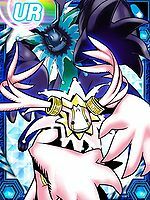 An Angel Digimon which has the appearance of a beast. 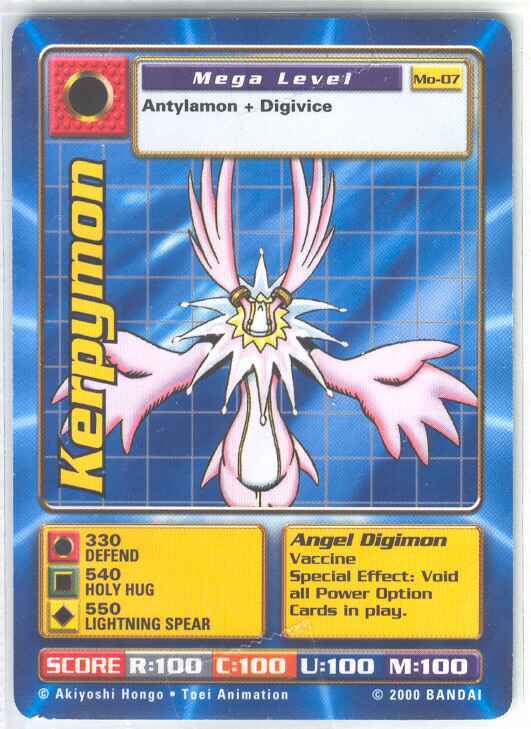 It is one of the Three Archangel Digimon assigned the highest rank, just like the Seraph Digimon Seraphimon. Its primary duty is to defend the Digital World's "Kernel". 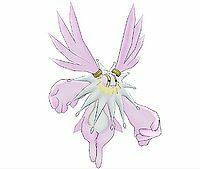 Angel Digimon, which are positioned at the ultimate "Virtue", have the aspect of their being easily stained by its antithesis of "Vice" as a consequence of their extremity. It uses mighty lightning techniques, and their strike is thought to be divine punishment. Its Special Moves are firing a spear of lightning (Lightning Spear), and summoning a gigantic thundercloud, then loosing innumerable thunderbolts on the opponent (Heaven's Judgment). n., Short for Cherubim (כרובים) 「ケルビム Kerubimu」, a class of angel. An extreme corruption of Cherubi. Heaven's Judgement  ヘブンズ・ジャッジメント Hebunzu Jajjimento Storm of Judgement/Heaven's Judgment/Holy Hug Calls multiple lightning bolts from the Heavens to rain down upon the enemy. 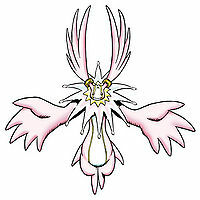 These lightning bolts are white and are somberly summoned unlike Cherubimon (Vice) who calls them violently. 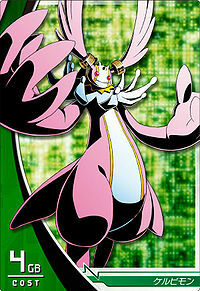 Forms a heavenly spear in Cherubimon's hand. 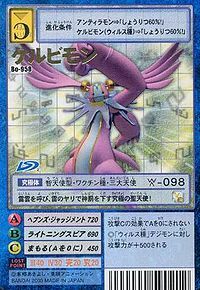 Cherubimon is one of the Three Great Angels. 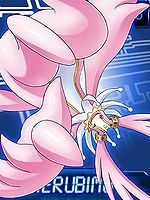 After feeling betrayed by Ofanimon and Seraphimon, Cherubimon became corrupted and became a virus type. 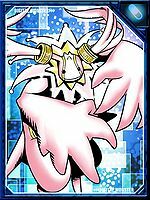 Lucemon used Cherubimon with the intention of gathering all the Digicode in the Digital World in order to be resurrected, yet Cherubimon kept the data for himself, seeking to increase his own power. Eventually, Kaiser Greymon succeeded in killing Cherubimon, releasing the data which the fallen angel had previously absorbed. 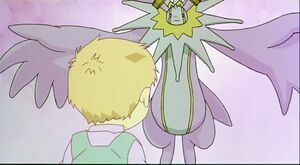 As such, Cherubumon was turned into a DigiTama and his DigiCode purified, later to be reborn as Lopmon. Can be evolved from Andiramon at level 41. Can be evolved from Andiramon if above level 40 and Holy EXP above 8000. Can be evolved from Andiramon if above level 62, mind 360, and Holy EXP 30000. 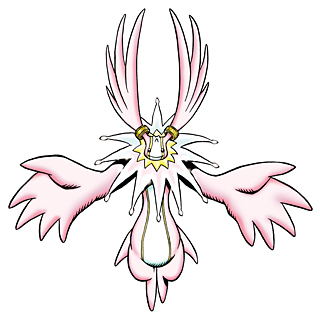 Cherubimon (Virtue) is an available Side Evolution for Andiramon (Deva). It can be unlocked if level 65 or above with the item Angel Rings. 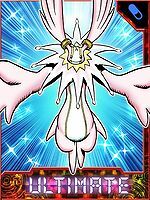 Cherubimon can only be obtained as a collectible card. 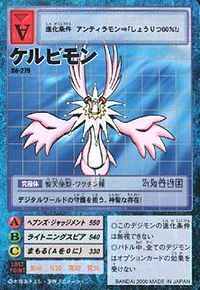 Its card is part of the Three Great Angels (三大天使 Sandaitenshi) set. 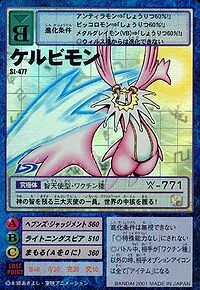 Can be obtained by Jogressing Holy Angemon with Megalo Growmon (1.0), Bastemon (2.0), or Grappleomon (3.0), or by Jogressing Bastemon with Andiramon (D-Scanner 2.0). One of the Three Great Angels who protects god's wisdom. It protects the kernel of the Digital World! This divine being shoulders the duty of protecting the Digital World! This ultimate holy angel summons thunder clouds and lowers its divine punishment with spears of lightning! ↑ Digimon Frontier: "Better An Egg Than An Egg Shell"
This page was last modified on 8 September 2018, at 09:25.